There’s nothing like an inspirational quote to lift your spirits and foster a pleasant mood throughout the day. Why not incorporate an inspirational quote into your home décor to uplift your mood and remember what’s important to you with our stylish quote canvases! 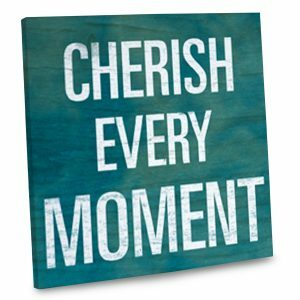 Whether you’re looking to add a spark of happiness to your daily routine or you simply want to spread joy in your home, our quotes on canvas are sure to add a touch of character and color to your décor. We offer a variety of options that will keep your spirits bright and remind you to “Love the Life you Live” or “Be the Best You can be Today”. 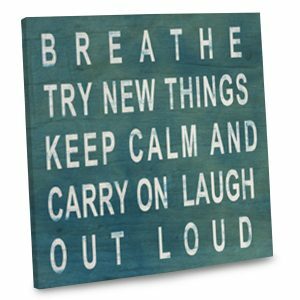 Our quote canvases can be hung in any room to instantly add good vibes to your day! Positive thinking never goes out of style! Why not decorate your wall with a stylish quote canvas and not only add a little color to your wall décor but also inspire healthy thoughts in your living space. Each quote canvas comes in a range of sizes to fit perfectly on any drab wall and is constructed with a gallery wrapped edge for a sophisticated look. Hang one in your living room above your couch or introduce a favorite quote to a blank corner in your kitchen. With so many styles to choose from and wide range of sizes, our canvas quotes are a truly versatile decorative accent that you’re sure to enjoy. Whether your home décor is simple and modern or cozy and rustic, our quotes printed on canvas are going to fit perfectly with your home’s style. Gallery wrapped edges give any canvas an artistic, sophisticated feel and are sure to make your living area look elegant. Looking for a unique gift for that special someone but just can’t seem to find something that’s as unique as they are? How about canvas quote wall décor to spruce up their living area with a little color and character? No matter who you’re shopping for, quote décor is sure to bring a smile to anyone’s face! Maybe you want to find your sister a fun birthday gift that accents her home. 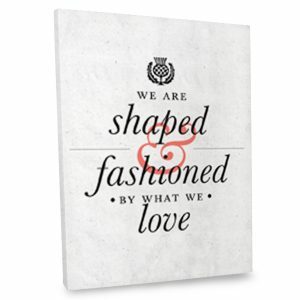 Choose from one of our many quote décor canvases and present it to her on her special day. She is sure to love the thoughtful sentiment it displays as well as its stylish look. We offer many quotes and sayings that are just right for any personality, making them a great gift for anybody’s birthday! Perhaps you’re looking for a thoughtful housewarming gift instead? Our quote canvas wall décor prints are perfect! They are a great way to instantly add positive thoughts to a new home and will be cherished for years to come by all new homeowners alike. Maybe your best friend just found the perfect apartment and you want to give her something unique for her new place. A quote canvas is sure to do the trick! No matter the occasion, whether it’s a birthday or the holidays, a wall décor quote canvas makes a wonderful gift. Just find a quote that suits your loved one’s personality, choose a size and consider your gift hunt done. Inspirational thoughts are great for all ages. Everyone needs a little motivational boost from time to time, so why not incorporate a thoughtful quote into your décor for all to enjoy. 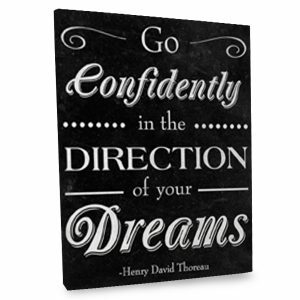 Our quote canvases are not only perfect for hanging in your family room but are also great for your kids’ rooms too! Our “Always Remember You Are Absolutely Unique” canvas quote would look amazing in any child’s bedroom. Keep their spirits high when they wake up each morning while adding a dash of personality to their room. While you are looking to decorate your kids’ bedrooms, why not check out our collection of custom photo toys and games to transform their bedroom into a unique décor showplace! In addition to your home décor, our quotes on canvas prints make a great addition to your office or small business and are sure to inspire success. We offer a range of sizes that will fit perfectly with any office space and are guaranteed to spark happy thoughts for everyone during the workday. 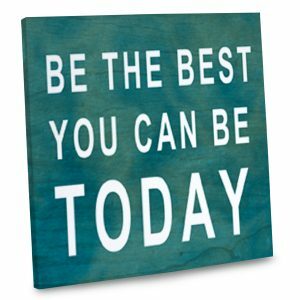 Canvas quotes also make a great gift idea for your boss or your favorite co-worker and they will display perfectly in any cubicle or wall at the office. For even more exciting office gift ideas, we have a range of photo décor that will make a wonderful addition to any workplace! 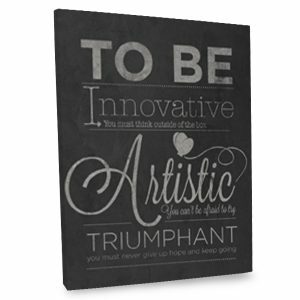 Whether you are looking to add inspiring thoughts to your daily routine or want to boost your décor with bright colors, our quote canvas wall art is sure to please. All of our quote canvas styles are printed on top quality artist canvas and are gallery wrapped for a truly sophisticated look. Hang them in your family room for a boost of personality or position one on your bedroom wall to wake up each day with happy thoughts. 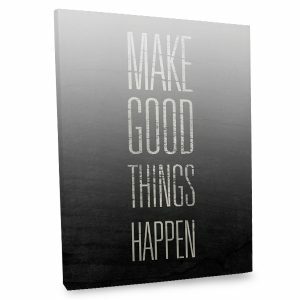 Canvas quotes also make a great gift for anyone both at home and at the office. Just find a quote that matches your loved one’s personality and style. All canvases come in several sizes so they’ll fit in with everyone’s home décor perfectly. No matter what you want to say, our décor quote canvases will add a unique, personalized flourish to compliment your distinctive taste!